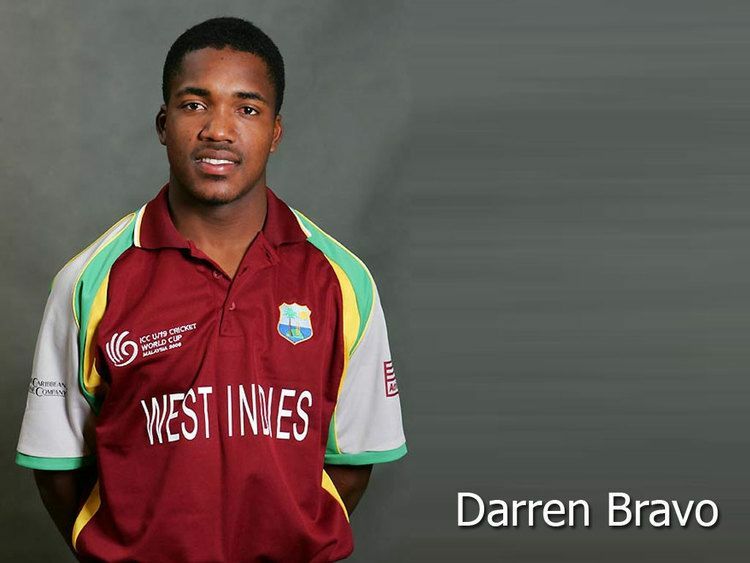 Darren Michael Bravo (born 6 February 1989 in Santa Cruz, Trinidad) is a West Indian cricketer who plays domestic cricket for Trinidad and Tobago and has appeared for the West Indies cricket team in One Day International (ODI) cricket and Test cricket. A left-handed batsman, he is focused and determined, like his role model, Brian Lara he too is a strong off side player: his batting style has drawn comparisons with Brian Lara. In fact, Brian Lara and Bravos mother are first cousins meaning Bravo and Brian Lara are first cousins once removed. He is also the younger half brother of Dwayne Bravo. Having played under-19 level cricket for Trinidad and Tobago Bravo made his first team debut in January 2007, he scored seven in a one-day match against Guyana. He made his first-class debut three days later against the Leeward Islands and scored eight. After another single figure score in his next match against the Windward Islands he made no other appearances in the 2006/07 season. He returned to the under-19 team for the TCL Under-19 Challenge and finished the tournament as leading run scorer, in five matches scoring 419 runs at an average of 59.85. In October 2008, Bravo was a member of the Trinidad and Tobago squad for the Stanford Series. Having failed to play in the first match against the Super Stars he came into the side for the next match against Middlesex and scored 27 not out including hitting the winning runs with a six over long-on. His domestic form in the 2008/09 season was much improved from the previous season, in the WICB Cup which Trinidad and Tobago won he scored 41 in the semi-final run chase against Jamaica and added 20 in the final against Barbados. In first-class cricket he scored 97 against Barbados, in a team score of 264 he was the last man out after 330 minutes of batting. Later in the month of January he scored a maiden first-class century against the Windward Islands, his innings of 105 included 13 fours and a six. The form led to his selection for West Indies A however an injury meant he missed the fixture against the England tourists. On his return to first-class cricket Bravo scored a second century of the season, against Barbados he added 111 and shared a 250 run partnership for the fourth wicket with Kieron Pollard. In the following match against Jamaica he scored 41 and 70 also equalling a Trinidad and Tobago record by taking five catches in the second innings. Older brother Dwayne praised his form saying: "He had been good with the bat and I am happy to see that he has been very consistent this season". Dwayne failed to pass 30 in his final four matches of the season but still ended the season with 605 runs at 43.21. In preparation for the 2008 U/19 Cricket World Cup the West Indies under-19s competed in the 2007/08 KFC Cup. Bravo played for the side in two matches, the first saw his team dismissed for a one-day record low total of 18, Bravo was one of six players who was dismissed without scoring. Bravo described it as a learning experience saying: "Collins was getting a lot of movement and Edwards was bowling very fast. It was difficult to get them away but the experience was good for us and it came in handy in the other games." At the under-19 World Cup Bravo played in all five of West Indies matches scoring 165 runs at 55. In the plate final against Nepal he took three wickets for nine runs (3/9) and scored 24 not out. Bravo finished the 2007/08 season with two first-class matches but failed to score a substantial innings with a best of 29.